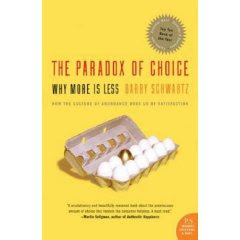 Doing some research today I stumbled upon this lecture ‘The Paradox of Choice: Why More is Less‘ by a leading expert on choice and its relationship to well-being, Barry Schwartz. * expecting perfection – and getting disappointed instead. All of these decrease your sense of satisfaction and well-being. According to Schwartz, these companies are already wise to the risk that the customer may choose nothing if faced with too many options, therefore they deliberately offer a more limited selection than they could otherwise do. It’s an interesting dilemma to be facing, whatever industry you’re in, and it’s one that’s going to get increasingly relevant as consumers become more affluent.